Shang, Wendy Wan-Long. The Way Home Looks Now. Fiction. Scholastic, 04/2015. 272p. $16.99. 978-0-545-60956-2. OUTSTANDING. GRADES 4-7. Twelve-year-old Peter recalls life before his older brother died in an automobile accident, before his mother became despondent, back when they rooted for Roberto Clemente’s Pirates and cheered Taiwan’s Little League team to the championship in Williamsport. Now his mother barely speaks, and his stern, immigrant father values schoolwork over baseball. Although Peter believes baseball holds the key to his family’s happiness, he is astonished and even a bit horrified when his old-school father volunteers to coach his Little League team. 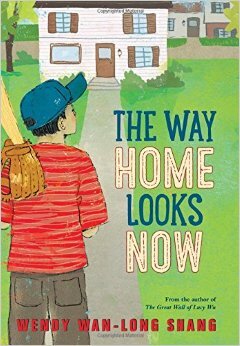 Peter’s first-person narration engages and seamlessly knits together Taiwanese American immigrant expectations, family tragedy, historical references to the Vietnam War and women’s liberation movements, and realistic baseball moments into a richly believable, absorbing story. Review based on an ARC. This entry was posted in Review of the Week and tagged The Way Home Looks Now, Wendy Wan-Long Shang. Bookmark the permalink.